Win Tickets ($280): Outdoor Music Festival in Canby: Harefest 4 @ The Wild Hare Saloon | Tributes to Journey, Led Zeppelin, Heart, Rolling Stones & More! We are giving away TWO 4-packs of SUNDAY-ONLY PASSES to Harefest 4 on July 20. To win, comment on this post why you’d like to attend. Winner will be drawn and emailed Friday, July 18. 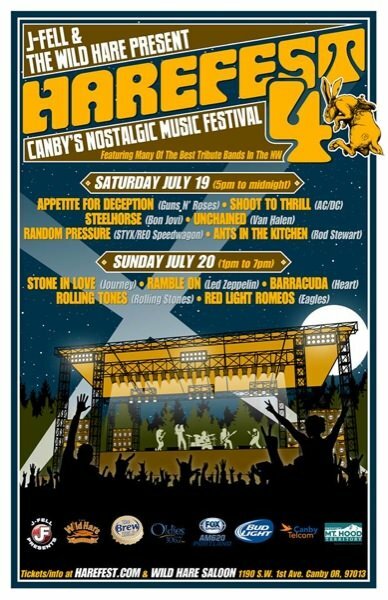 Top-notch northwest tribute acts headline two days of nostalgic rock music, food, and drink outdoors in Canby! This fourth-year event is sponsored by 105.9 The Brew, Oldies 106.7, Fox Sports 620am, Bud Light, Jack Daniels, Bacardi, and Canby Telecom. 29 Responses to Win Tickets ($280): Outdoor Music Festival in Canby: Harefest 4 @ The Wild Hare Saloon | Tributes to Journey, Led Zeppelin, Heart, Rolling Stones & More! I <3 Stone In Love! Love the name of the fest and love the bands that are being given tribute. Sounds like a great way to spend the weekend! Rock and Roll!! And Canby!! Hello!! But seriously, I’ve heard great things about this event from previous years and would love to check it out in person. Thanks for the chance to win tickets here. Oh pick me pick me! I’m a huge hair band fan! Mine. Mine. Mine. Gah pick me! Yes please I start my second course of radiation on Monday it would be nice to do something fun on my last day of freedom. New to Oregon! Would love to make this our first Oregon concert! Wow, do I miss the 80’s!!! You could say that I’m a connoisseur of tribute bands. Does that make me a tribute fan? I would like to attend for the pure ridiculousness of the situation. Just to experience an event like this would be amazing. this sounds like a blast! choose me!!! I live only about 7 miles from there so would be an easy drive. Both my husband and i would love to attend. This is my birthday weekend and am looking for a memorable one! Tributes to Heart, Journey, and Led Zeppelin? What’s better than that?! I would love to win tickets to take my family. Mainly my step mom, she’s die hard hair fan! This would be a great gift! My son is in the 101st Airborne. He will be home on leave for this!! He was in Afghanistan last year at this time…..so this would be such a great opportunity to have fun and spend time with him. Army Strong! I am a single parent who would love to take my son to his first concert ever. He is now 22 and still lives at home, he is legally blind and loves music. We both love rock music, pick us please. I turned 50 this year, this genre is right up my alley!